Here we are. Following hot on the heels of a successful launch for Magic: The Gathering Origins here we are at the doorstep of another epic battle between top Magic: The Gathering pros from across the globe. Over $250,000 USD is on the line, with the winner taking home a hefty $40,000 after three days of intense competition in Vancouver, Canada. As per usual, the Pro Tour weekends now feature a mix of booster draft (ORI-ORI-ORI) and constructed formats with 3 rounds of draft Friday morning, followed by 5 rounds of Standard starting around 4-5pm EST. For the MTG Finance community, the big question on all of our minds is whether any new cards from Origins will break into the spotlight in Standard and push our recent specs into profitability. Will there be a chance to get in on something that shows early promise or will the hype train leave the bandwagon speculators out in the cold without buyers come Monday morning? Many of the top teams have been in stealth mode for the last couple of weeks, furtively holed up BC cabins and AirBnB pads attempting to break a format open that has stubbornly refused to allow a single deck to dominate for the duration of an amazingly varied season. Game 1: Mihara gets stuck with 3 Rally the Ancestors in hand, without creatures in the graveyard. Unable to get his combo pattern going, Mihara moves on to Game 2. Game 2: Shahar manages to answer the early threats from Mihara, clearing Jace, Husk and Whisperwood with burn and a Valorous Stance. Randy Buehler calls out that Rally decks make up less than 15% of the field, suggesting that the pros found better options in testing. Without a combo move in Game 2, Shahar manages to take out Mihara with burn to the face. Game 1: Scott Lipp is on a U/R Thopter/Ensoul Artifact deck. Already seeing Hangarback Walkers start to dry up on Ebay. He takes down Seth Manfield in Game 1 from 7 with a Shrapnel Blast and some Thopter attacks in the air. Game 2: Several turns in Lipp has Manfield on the ropes, with thopters in play and Manfield’s life total at 6 to Lipp’s 21. Manfield makes a smart play, leaving up a potential double Polukranos activation to ensure he can soak up an attack step and take out some flying robots. The very next turn however, Lipp top decks an Ensoul Artifact, drops it on an Ornithopter and hits Manfield with a Shrapnel Blast to take the match. Randy notes that G/R decks make up the biggest portion of the field at around 15%. Sullivan notes that Languish pushed people off creatures that would make it good, so he chose to run a more diverse sweeper package. He goes on to explain that he isn’t running any creatures, due to the available options being weak to the field. The players split the first two games to set up a tie-breaker. Scott Lipp takes down the Jeskai Ascendancy deck with his U/R deck to go to 5-0. Thoptor Engineer and Whirler Rogue seeing Standard play! A lot of the better known teams are on mono red, many using Abbot of Keral Keep. Game 1: Lee Shi Tian takes down Herzog in Game 1 with a flurry of carefully timed fire spells. Dragon Whisperer and Flamewake Phoenix on camera. Game 1: Rietzl uses Zurgo Bellsmasher and Eidolon and Swiftspear to get in for strong early damage pushing Calcano down to 1 life and then quickly puts him out of his misery. Game 2: In Game 2 Calcano manages to survive an early onslaught with the tactical use of Drown in Sorrow and Tasigur. He then manages to get a flipped Jace, Vrynn’s Prodigy in play. Double Feed the Clan gain Calcano 20 life and makes it highly unlikely that Reitzl will be able to take back control of the game. With Reitzl run out of cards, a Den Protector goes the distance with a bit of removal clearing the way. Game 3: After some early trades Reitzl manages to resolve an Outpost Siege on Khans, ensuring some key card advantage heading into the late game. Again, Calcano manages to gain 20 life off a pair of Feed the Clan, demonstrating the value of a solid sideboard plan against the red decks this weekend. A turn later, he draws yet another one, setting up to gain 30 post-sideboard. Reitzl however, manages to get another Outpost Siege in play, and sets himself up for 3 cards per turn to keep in the race. With Paul at 4, Calcano puts it away by eliminating a Heelcutter with a Downfall to ensure his Den Protector could get in for the win. Off-camera Shehar Shenhar goes to 6-0 takes the top seed in the tournament with his Jeskai Mid-Range deck. Game 1: Floch takes Game 1 after maneuvering out from under a deluge of damage. Game 2: Flores is able to put Game 2 away on the back of early beats and a pair of well time burn spells. Game 3: Floch pulls the deciding game out of the jaws of defeat, having drawn timely Reclamation Sages to deal with multiple Eidolon of the Great Revel. Our final round of the day finds us examining a seminal matchup in the current metagame, with the explosive closing power of the red aggro deck up against the attrition focused value deck with the combo end game. Game 1: This game was swingy, with a noteable Abbot of Keral Keep getting used for maximum value into a Lightning Strike setting up a tight win. Game 2: In Game 2 Larsson was unable to find early action after a mulligan and McClaren took him to town with multiple combo shots on the back of Rally the Ancestors. The Rally decks are looking solid heading into Day 2. Game 3: Larsson’s risky keep with a low land count paid off in the final game as he was able to play out on curve and put Shaun away before he could really get anything going with his slow play combo deck. Larsson takes the game and match, and puts red aggro back on the map as the deck to beat heading into Day 2. With all of the testing this week there’s also the distinct possibility that this weekend will mark the debut of a sweet new brew. With Standard starting around early Friday morning EST, the stage is set for first mover advantage if an unexpected deck jumps out to an early lead in the hands of a reliable pilot. Which deck are you rooting for? Rally the Ancestors: Ready to Repeat? The 5-color Rally deck came out of nowhere at lesser tournaments over the last couple of weeks to establish itself as a solid Tier 1 strategy in the waning days of Theros/Khans block Standard. The deck functions as a value deck in the early turns, only to go off explosively by recurring a bunch of value creatures onto the battlefield to draw cards, kill creatures and set up huge attacks. The card at the core of the deck has already exploded from a bulk $.30 rare to a $3 mover, but it’s definitely possible that a deep run this weekend could set the card up to challenge $10. Hangarback Walker: Best Bet to Explode? Totally ignored when spoiled, play testing quickly showed that the Walker had the potential to fulfill a vital role in a format with infinite creature kill. Much as Voice of Resurgence did in it’s heyday, the ‘Walker sets up a situation where your opponent is forced to endure card disadvantage just to start dealing with it. The ability to shrug off sweepers, provide blockers to defend your Planeswalkers, and provide threats to go after Ugin all add up to a very solid card that has already spiked up into the $10 ceiling for new site rares. The question then, is whether Hangarback Walker can dominate PT Origins and set the stage to become the next Goblin Rabblemaster, pushing up past the $20 plateau so rarely achieved by standard rares. Jace, Vrin’s Prodigy: Best of the ‘Walkers? Originally available at a much-maligned $15-18 on pre-order, teen angst Jace is just the latest in a long line of underestimated staples this year that had to get played to be believed. Now holding a $30 price tag, a top 8 appearance or some serious camera time could be all this card needs to push up to the $40 ceiling for new set mythics. As a looter with long-term upside, Jace loves to set up shop behind some blockers and buy time to start re-buying powerful spells out of the graveyard. As an easily splashable card that is often played as a 4-of, we can expect Jace to show up in everything from 5-color Rally, and U/B Demonic Pack builds to Jeskai Tempo decks. There may not be a lot of upside left, but if you think you may need a play set, I wouldn’t hesitate at this point. Nissa, Vastwood Seer: Role Player or Pillar of the Format? Like Jace, Nissa was hotly debated once announced. Early feedback on this card has confirmed that it is a reliably solid play to be making in the early to mid-game, which often also has the potential to dominate the late game. That being said, most decks running the card are only running a couple of copies, and it seems to be largely limited to the ramp camp for the time being. Currently sitting around $25, there may be the potential to make $20-$25 on a set if the card spikes off heavy play this weekend. Dragonlord Ojutai: Time to Flee? Ojutai occupied the underrated powerhouse slot at the last Pro Tour, enjoying a powerful spike into the $40 range on the back of heavy play. With the shift in the metagame driven by MTG Origins cards however, the Dragon Control strategies have been taking a back seat to other archetypes and the presence of Languish and Rally deck sacrifice effects doesn’t help much either. Dragonlord Ojutai is currently hanging out around $20, but I’d be looking to get out now for fear that the card may find a fresh floor closer to $10 on low play. Demonic Pact: Time to Shine? Demonic Pact has been disparaged for being too durdly, but rumors abound that select pros are on various versions of decks that make good use of the card in Abzan or U/B control shells. The blue decks can bounce it to reuse and the W/G decks can Dromoka’s Command for value, and as a mythic around $5, the conditions are right for a spike if it makes it on camera and ends up in the Top 8. A reasonable target of $10-15 would be the likely result. 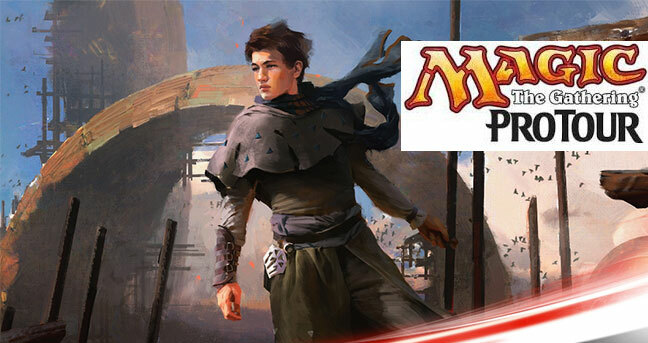 Stay tuned for Round by Round MTGFinance coverage of Pro Tour Magic Origins all weekend! Where is your analysis on See the Unwritten? Seems to ooze future value in cheating eldrazi out. You do realize it is about the Pro Tour ORIGINS? No Eldrazi yet. Word is Red is THE deck to beat this weekend. May not be the best one there, but it’s definitely there. Come on rally one more time. I picked up a quick 20 playsets on ebay at 1.47 when I saw Michael T’s deck the first time. I picked up 8 playsets of Abbot of Keral keep at 12.99 a playset, this is my favorite card of the set. I’m hoping there in another graveyard enabler like whip of erebos or ojatai’s command in the future that allows for some sick action during an opponents turn with abbot. Keep the updates coming. Now for my sad story, I preordered Demonic Pact at 15.49 but it looks like the dealer has stiffed multiple buyers. He does have over 2000 positive feedbacks this month but 27 negs for orderst not shipping. Please let me be one of the buyers who gets his cards.